Christ-Follower. Content Marketer. Social Media Strategist. Husband and Father. WordPress Enthusiast. 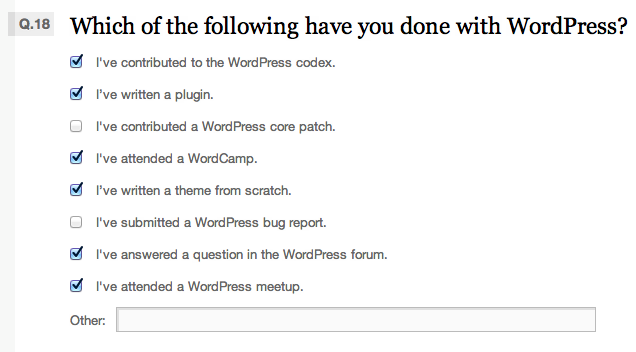 What do you do with WordPress? WordPress is the blogging engine and content management system that powers this blog, most of the sites I’ve created over the years, and more than 54 million sites that power the internet. The results of this survey are shared at WordCamp San Fransisco each year, then published. I’m always excited to see the averages that freelancers charge, the demographics of WordPress developers, and the crazy cool things people do with the platform. One of the coolest things about WordPress is the community of users, developers, designers, entrepreneurs, and support folks that make it better all the time. Anyone can do any one of the things listed above. Check out this real-life, real-time example of the WordPress community: Tim, who maintains the popular podPress podcasting plugin is actually helping me to make my plugin better after helping resolve a code conflict between our plugins. Totally above and beyond what was required of him to simply resolve the conflict! What are you doing with WordPress to make the platform and community better?